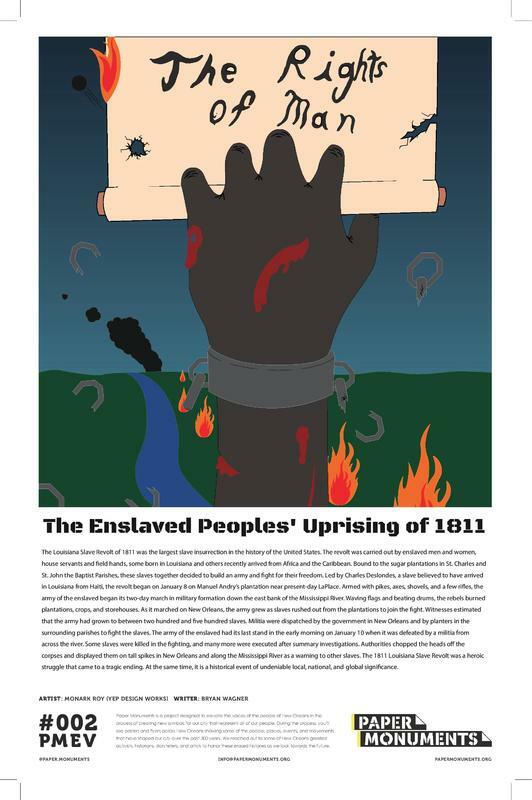 Paper Monument Project #002: The 1811 Louisiana Slave Revolt was the largest slave insurrection in the history of the United States that came to a tragic ending. It is a historical event of undeniable local, national, and global significance. The Louisiana Slave Revolt of 1811 was the largest slave insurrection in the history of the United States. 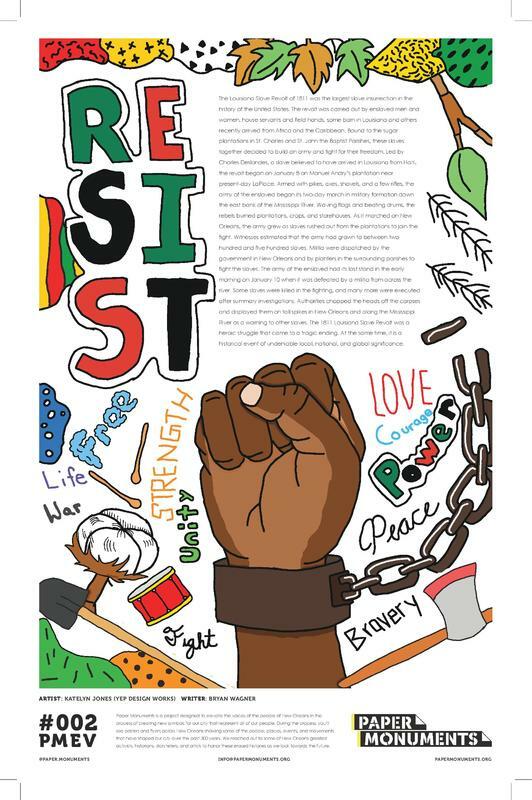 The revolt was carried out by enslaved men and women, house servants and field hands, some born in Louisiana and others recently arrived from Africa and the Caribbean. 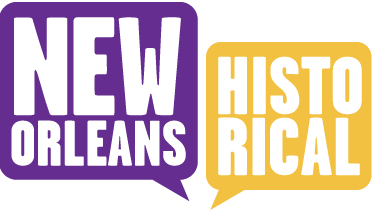 Bound to the sugar plantations in St. Charles and St. John the Baptist Parishes, these slaves together decided to build an army and fight for their freedom. Led by Charles Deslondes, a slave believed to have arrived in Louisiana from Haiti, the revolt began on January 8 on Manuel Andry’s plantation near present-day LaPlace. Armed with pikes, axes, shovels, and a few rifles, the army of the enslaved began its two-day march in military formation down the east bank of the Mississippi River. Waving flags and beating drums, the rebels burned plantations, crops, and storehouses. As it marched on New Orleans, the army grew as slaves rushed out from the plantations to join the fight. Witnesses estimated that the army had grown to between two hundred and five hundred slaves. Militia was dispatched by the government in New Orleans and by planters in the surrounding parishes to fight the slaves. The army of the enslaved had its last stand in the early morning on January 10 when it was defeated by a militia from across the river. Some slaves were killed in the fighting, and many more were executed after summary investigations. Authorities chopped the heads off the corpses and displayed them on tall spikes in New Orleans and along the Mississippi River as a warning to other slaves. The 1811 Louisiana Slave Revolt was a heroic struggle that came to a tragic ending. At the same time, it is a historical event of undeniable local, national, and global significance. 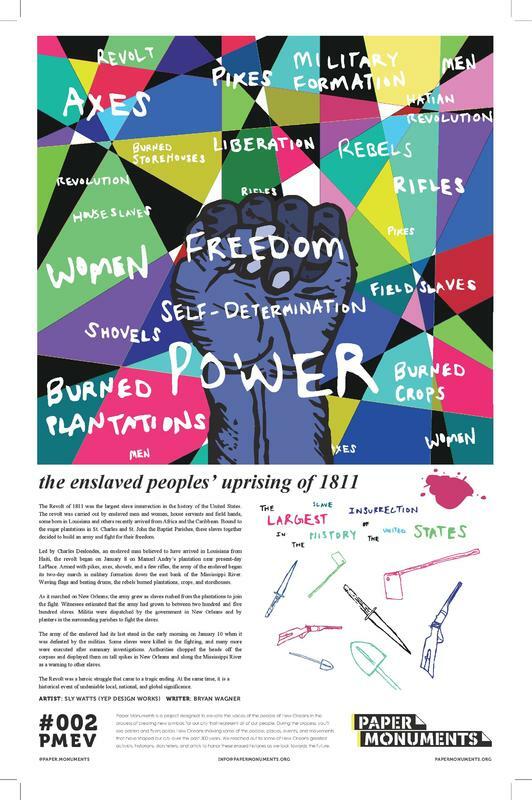 Paper Monuments et al., “The Enslaved Peoples' Uprising of 1811,” New Orleans Historical, accessed April 24, 2019, https://neworleanshistorical.org/items/show/1402.